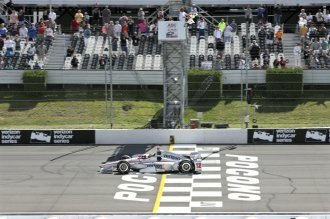 Who Won the Race at Pocono Today? 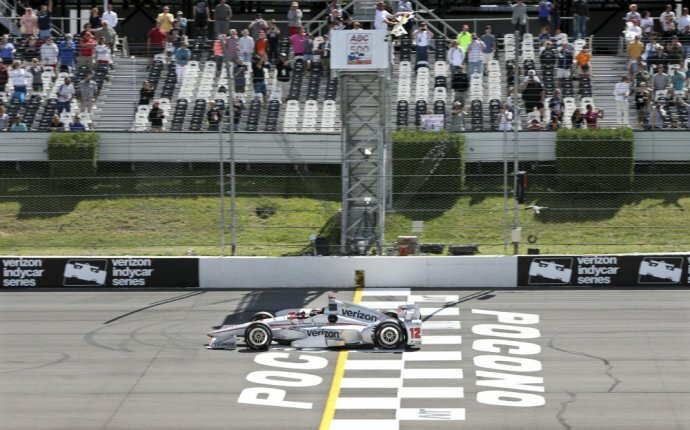 WINNER: Will Power’s summer march toward a second Verizon IndyCar Series championship continued at Pocono Raceway Monday in a race delayed from Sunday because of rain. It benefited greatly by a crash by his Team Penske teammate and points leader Simon Pagenaud. All four of Power’s wins this season have come in the last six races. He missed the season-opener at St. Petersburg with a misdiagnosed concussion which turned out to be an inner ear infection. Power moved methodically through the field from the eighth starting spot to control the last quarter of the race, and had a main threat, Ryan-Hunter-Reay, peel away with a mechanical problem. Power held off hard-charging pole-sitter Mikhail Aleshin who prodded for the lead in the final laps but finished second, 1.1459 behind. Hunter-Reay was third. Power, who won the 2014 series title, now trails Pagenaud by 20 points with three races left in the season. The series will resume the interrupted event at Texas Motor Speedway on Saturday. POWER FAILURE: Hunter-Reay stalked or held the lead for much of the race but was forced to come slowly down pit road when he lost mysteriously lost power immediately after retaking the lead from Will Power on Lap 164. He fell a lap down. The Andretti Autosport driver is winless this season and started last after crashing in practice and not making a qualifying run. Hunter-Reay roared through the field early and had been running up front for the majority of the race before the power issue. He got back on the lead lap after a caution for debris on Lap 175 and drove all the way back to finish on the podium. TITLE TURNOVER: Points leader Pagenaud crashed exiting Turn 1 on Lap 157, tightening the championship race. The Team Penske driver led teammate Will Power by 58 points entering the race. Power had assumed the race lead just a few laps before Pagenaud’s crash. Pagenaud’s Chevrolet appeared to lock brakes through the sweeping turn and side-swiped a SAFER barrier hard before drifting to the bottom of the track. Pagenaud finished 18th. His worst finish of the season was at the other 2.5-mile track on the schedule, Indianapolis Motor Speedway, where he was 19th at the Indianapolis 500. PIT FALLS: Helio Castroneves, Alexander Rossi and Helio Castroneves were involved in a bizarre pit road accident on Lap 63. Kimball, slowing to pit but in the fast lane, bumped Rossi, who was exiting his pit and attempting to merge right from the slow lane, sending him over the top of Castroneves, who was also exiting his pit. Rossi’s front tire came within inches of Castroneves’ head, ripping off his right mirror. Kimball was able to continue and there were no injuries. Castroneves began the pit sequence fifth. Rossi said had been released by a crewman to rejoin pit lane. IndyCar intended to penalize him for avoidable contact and contact with pit equipment if he returned to the track. “All of a sudden I just saw a car on top of me; I didn’t see anything else, ” Castroneves said It was pretty scary … but to be honest inside the car we’re protected than people realize.” The Team Penske crew attempted to repair the No. 3 Chevrolet before shutting it down, leaving Castroneves with a 20th place-finish. The Brazilian entered the race ranked third in the standings but will drop with the DNF. - Who Won the Indy 500 Today? - Who Won the Coca Cola 600?